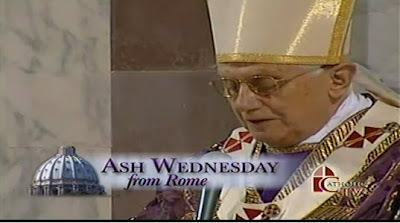 CatholicTV is presently broadcasting the Ash Wednesday Mass from Rome this Ash Wednesday. The procession will begin at the Basilica of San Anselmo and will conclude at Rome’s Basilica of Santa Sabina. Prior to Mass, the Holy Father presided at brief prayer in the nearby Church of San Anselmo on Rome’s Aventine Hill. This is also where the ashes are blessed. During the Mass at Santa Sabina, the Pope will also preside over the traditional rite of blessing and imposition of ashes. The Vatican pointed out in a communiqué that the day’s activity will continue an ancient Lenten tradition, long held by the Church in Rome of celebrating Mass in designated "station" or churches, which change each year. All of this is airing on CatholicTV and a live stream at CatholicTV.com on Wednesday, Feb 25th and will include English translation. The airtimes will be 12:30PM and an encore presentation at 8:00PM.